For various reasons I have to slaughter some quail from time to time. I may have too many males, it may be necessary to introduce new blood in to the breeding pens, hens may stop laying, and so on. My method of preparing quail for the pot has evolved through experience and may be useful to someone. I would like to know how others approach this fairly unpleasant task! Line a 20 Liter bucket with a black garbage bag and after decapitating the quail with a meat cleaver, hold the bird over the open bag to let it bleed. Hold the wings to prevent them from fluttering and splashing blood. After about one minute tie a piece of soft wire around one leg and hook it over the side of the bucket, letting the bird hang inside the bucket, to let it bleed into the bag. Submerge the bird in scalding water for ten second then immediately pluck all the feathers until the carcass is clean. 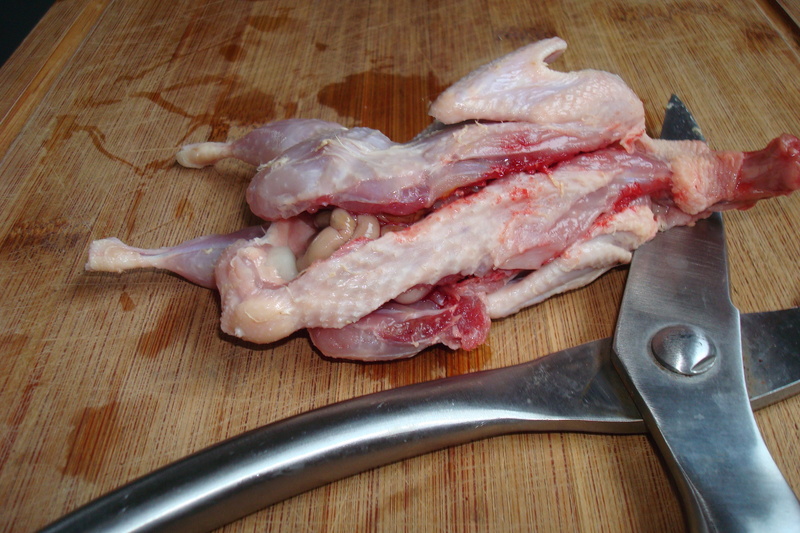 Cut the feet off by cutting through the shank close to the hock joint – (foot side of the joint). 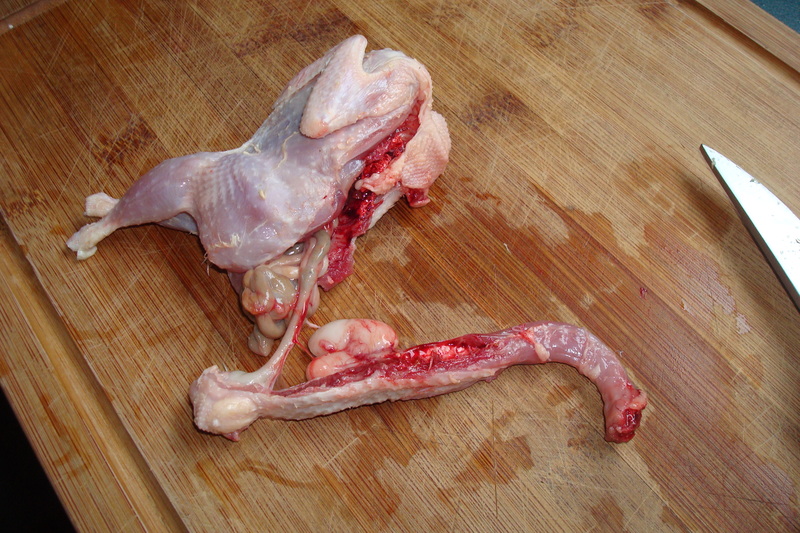 If you cut through the joint the meat retracts from the thigh when cooking and exposes the bone. 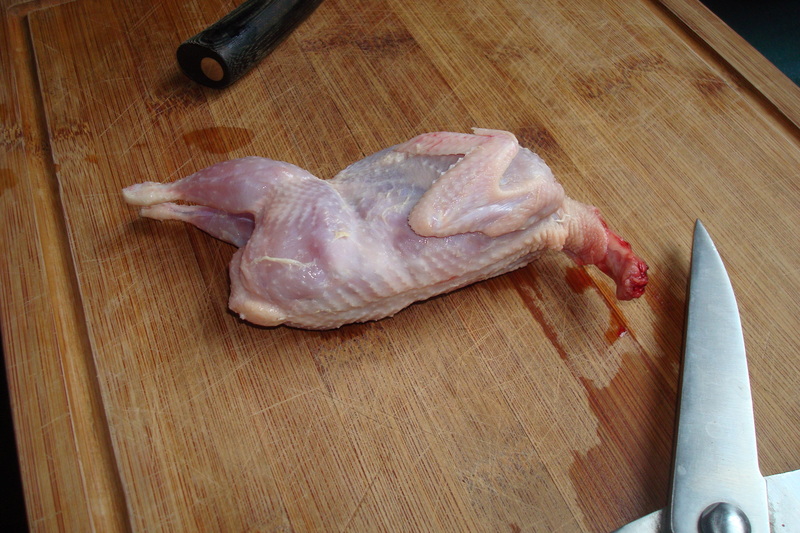 Take a meat shear and insert from the back hard up against the backbone. Cut all along the backbone, keeping the inside tip of the shears close to the top, until you have cut through right to the front. Do the same to the other side of the backbone. If you keep your shears against the inside top, you would have missed all the entrails. Cut through the backbone as close to the cloaca as possible. Also cut through the skin immediately below the cloaca. The backbone / neck sections goes straight into the dish holding all the parts to cook stock from. 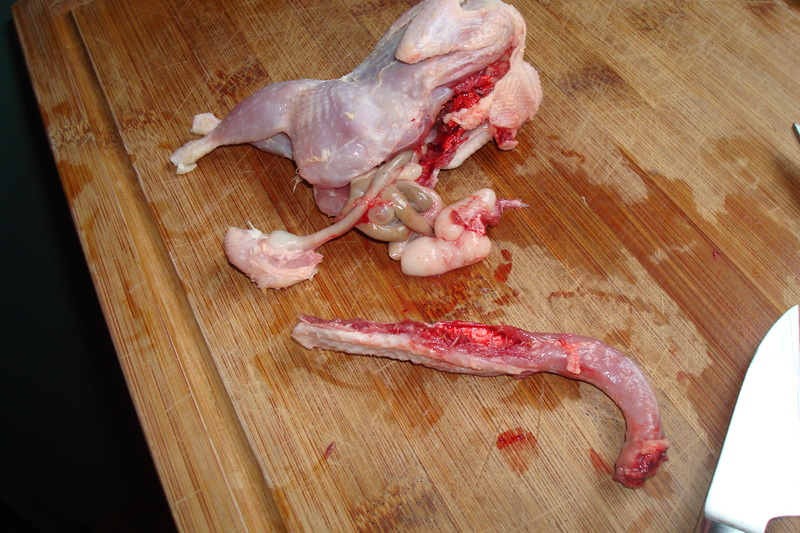 By inserting your middle finger underneath the entrails, starting from the back and moving your hand forward keeping your finger against the breastbone you will lift all the entrails out, intact without soiling the carcass. 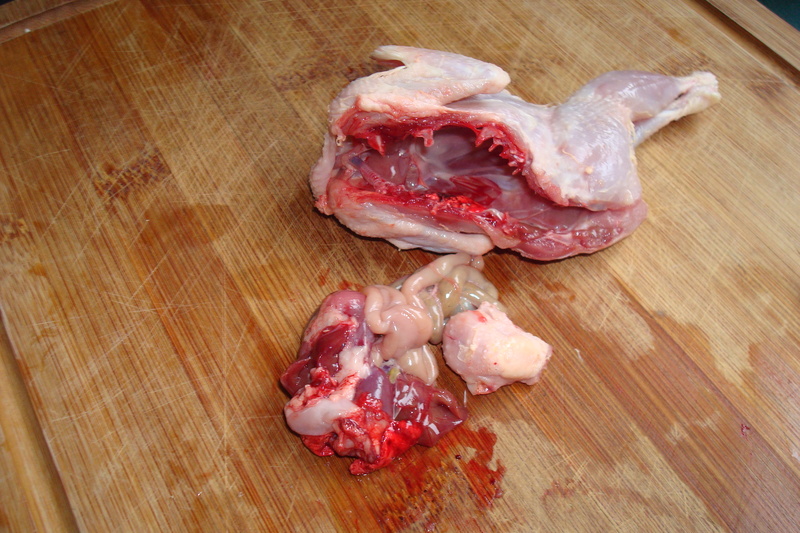 The only parts that may still be attached are the lungs – scrape these out and put into the stock dish. Cut the neck skin short and ad this to the stock dish.Wash the carcass and leave to dry a bit. 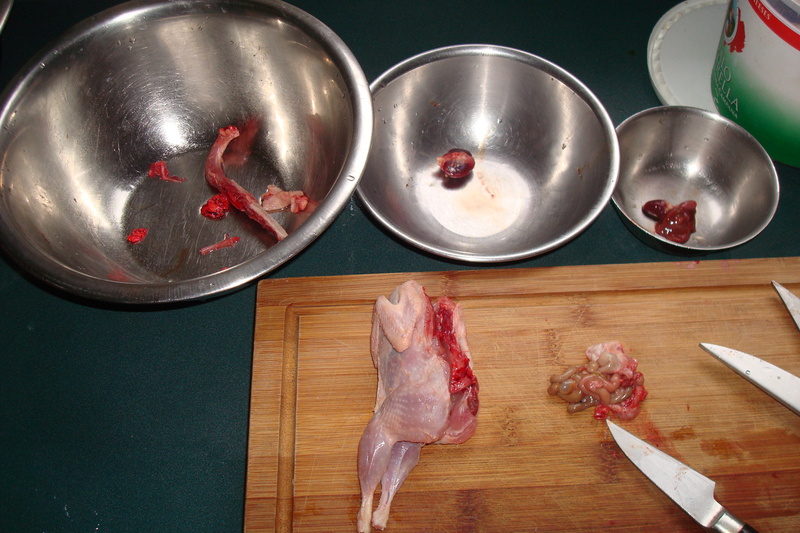 Carefully remove the gizzard and put into a separate dish for cleaning later. Also cut loose the proventriculus and hart which goes into the third dish. Make sure you identify the gall bladder and cut it loose from the liver without spilling gall onto the liver. 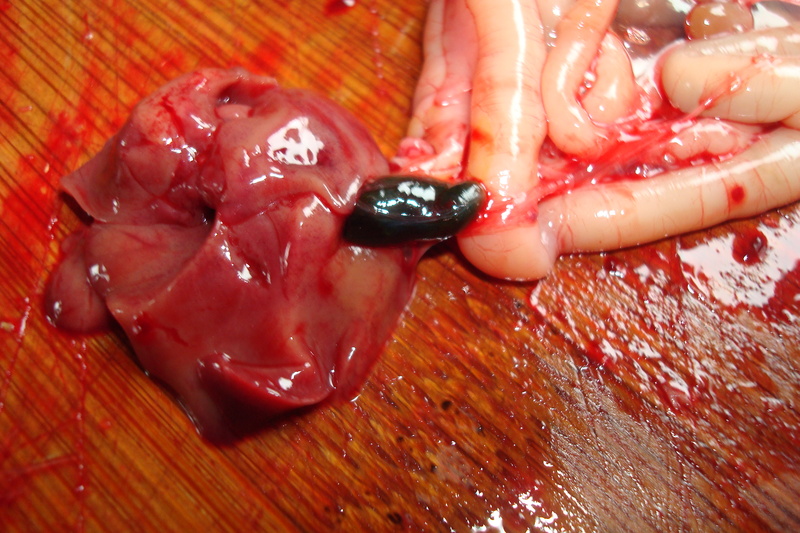 The liver then goes with the proventriculus and hart and also add the gizzard after cleaning to make wonderful quail liver dishes like risotto . 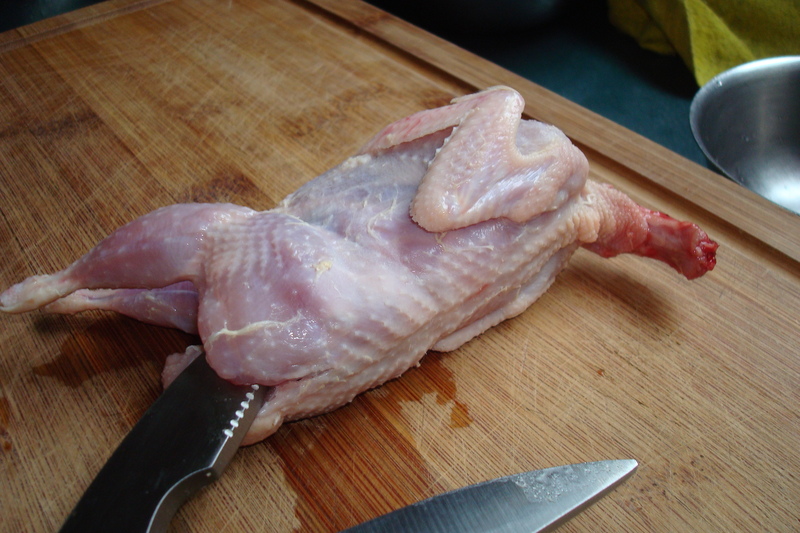 Butterflying your quails in this described way instead of cutting through the breastbone (from the front instead of the described way from the back) you retain the moisture in the breast much better during cooking. No damage is done to any of the expensive cuts either. The backbone, which is always difficult to eat and does not have much meat makes great quail stock. I like your sense of humor! I have no rabble yet because of the post, but I do have a complaint about the guts and blood picture. I thought about this post, but could not find a gentler way to say it! Quail are the best way of adding protein to a diet if you are ‘farming’ in an urban backyard. The eggs are great but one has to eat a quail or two every so often. Many people are novice quail keepers so this could help them a bit. I have no problem with the culling. I have chooks (chickens) and I know that there is nothing like 4000 roosters going off at 3am for your neighbours to all organise an angry rabble complete with torches ;).